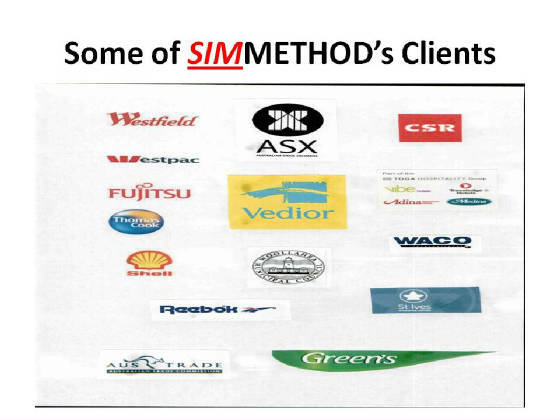 At AM Corporation I used the SIMMETHOD to rebuild AM Corporation’s customer administration and service delivery. As a direct result of using the SIMMETHOD we installed streamlined systems and automation technology for same-day processing of transactions. This created a competitive advantage and a fast-response capability that underpinned AM’s growth in size and bottom line. This change resulted in over $4 million of cost savings. John Clark, COO, AM corporation. “I would like to take this opportunity to thank you on behalf of CSC, for the excellent work that you have done on the CMG/LG Insurance Project.” Peter Rehn, Deputy Division Manager. “The company’s action reflects the high esteem in which you are held and we look forward to your continuing relationship with and contribution to Westfield in the future.” Frank Lowy, Chairman. “This note is to express our thanks and recognition for your successful completion of the Foreign Exchange Project Management assignment at Thomas Cook. The results achieved are a positive reflection of your ability and application.” Morgan and Banks. “Congratulations on an excellent performance. Your contribution within Westpac is recognised as being excellent. You have obviously managed to gain the respect of your peers and Managers within Westpac through sheer hard work and determination.” Paul Modley, Client Services Manager, Andersen Contracting. 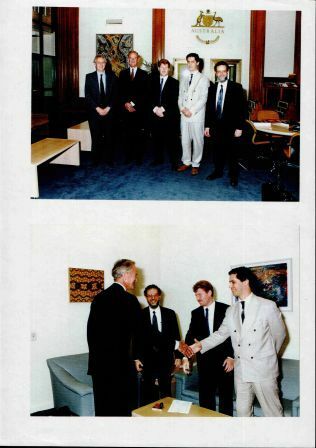 Export of Australian Intellectual Property: Jorge Tabacman wih Mr. Warwick Weemaes, Australian Ambassador to Argentina at the signing of a SIMMETHOD™ contract in Argentina. “SIMMETHOD™ methodology is the ability of any Principal within a business to navigate the myriad of financial processes and arrive at the focal point of what makes the business successful. It is a comprehensive methodology that translates a company’s strategic objectives into a coherent set of performance measures, ultimately adding real dollars to the bottom line”. Edmund Khalaf, CFO and Group Vice President. "Selecting only ten businesses to short-list was difficult for the judges, who received an influx of quality applications from across NSW, representing a broad range of industries including transport, new media, alternative energy technologies and home furnishings. “The short-listed companies chosen to make their pitch have all demonstrated mature business planning and innovation, and offer significant and practical market potential,” she said.